Charles Smith has caused quite a stir selling shirts online. 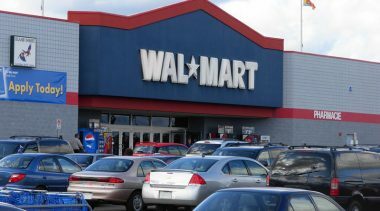 Corporate behemoth Wal-Mart wants to shut him down and now the two sides are locked in a legal battle over free speech. Why all the fuss? Smith’s shirts depict the familiar Wal-Mart logo as well as well as the message “I [heart] WAL*OCAUST.” Yes, Smith thought it clever to compare a seller of cheap products to the holocaust, one of history’s most ghastly acts of mass murder. 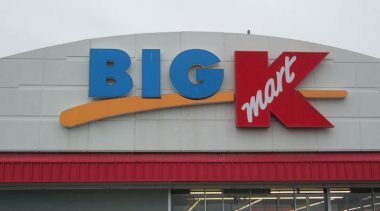 Most discussion has settled on Smith’s pathetic conflation of retailers and Nazis and whether Wal-Mart’s claims of trademark infringement are legitimate (probably not). Yet there’s another issue here-if Smith truly believes in the message of his shirt, then he’s not so innocent either. In Smith’s view, Wal-Mart and the Nazis both spread destruction. Indeed these days many regard the biggest box as a destructive force that wipes out mom and pop businesses. But it wasn’t long ago that America was even more frightened by the internet-the same diabolical tool that Smith used to sell his shirts. During the 90s brick and mortar businesses trembled at the thought of competing with online businesses that could operate so cheaply (less overhead, fewer employees, and no sales tax in many cases) and undermine the proximity advantage that encouraged local customers to patronize local stores. And while Wal-Mart’s influence is gigantic, it’s small compared to the internet. 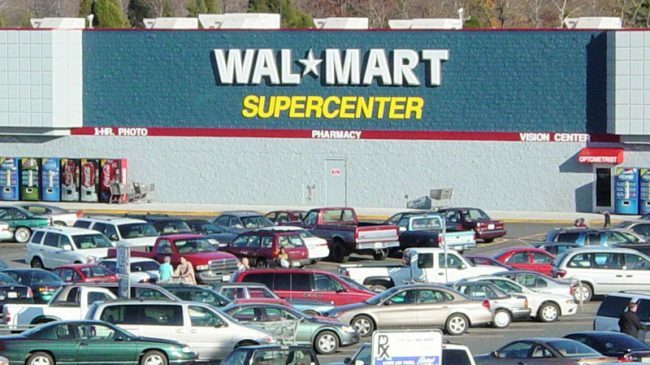 The combined value of just two internet industries (Internet Information Providers and Internet Software) tops Wal-Mart’s value of $188 billion by a wide margin, and those industries represent only a sliver of the $5 trillion tech sector, which relies heavily on the internet for its existence. But should we cheer the internet’s emergence? Think of all those travel agents who lost their jobs because they couldn’t compete with the likes of Travelocity and Priceline.com. Think of all the mom and pop operations that shut down because of the emergence of online shirt-sellers like CafePress-the company Smith used until recently. Then again, if we focus so much on destruction, we might forget that innovation is a powerful force for creation. Today’s jobseekers can apply for openings in web design, internet engineering, e-commerce and many other job categories that didn’t even exist a generation ago. If the internet never emerged how many of the 3.2 million Americans who work as computer scientists, programmers, software engineers, support specialists, and network administrators would be stuck with a worse job or no job. Countless others in fields not directly related to the internet have jobs thanks, at least partly, to America’s willingness to buy, sell, swap, and read things online. Indeed CafePress helps other businesses succeed because the company uses innovations that lower costs and help democratize entrepreneurship. In the “old” days a regular guy like Smith would have little chance of annoying the world’s biggest company. Without the internet he could show his shirts to the small number of people who live nearby, but with the internet he can display them to people Bentonville to Bangalore. And there’s also the issue of cost. In pre-internet America Smith would have had to go to his local silk screener, pay to make a bunch of shirts at once, and hope he could sell enough of them to make a profit. But online companies dramatically reduce these up-front costs because they make only as many shirts as customers order. CafePress and other internet operations create new opportunities and the story is similar with Wal-Mart. 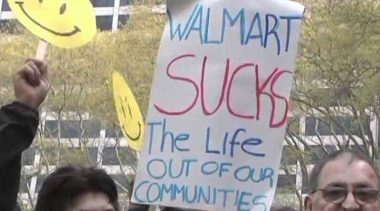 Just as we heard so much about the Internet’s destructive side, today that’s all we seem to hear about Wal-Mart. But the company is also a force for creation. Some may sneer at the jobs it offers. One Chicago priest even calls them “slave jobs,” but the jobseekers who line up to apply for them disagree. Recently Wal-Mart opened a store in Oakland and more than 11,000 people applied for just 400 openings. They realize that low paying jobs serve as training ground for bigger and better things. “You start low and aim high,” said one applicant. And sometimes Wal-Mart helps people hit it big right away. Many small inventors get rich shortly after the retail giant stocks their products. No doubt many businesses quiver when Wal-Mart comes to town, but the company can also help invigorate Main Street. People who spend less on basics like toothpaste, paper towels, and cereal can spend more money patronizing orthodontists, bistros, boutiques, and other establishments that only wealthy societies can support. Americans are typically quick to defend the freedom of speech, but like Smith they’re also quick to assume that latest and biggest innovator is a dark force of evil the likes of which we’ve never seen before. Here’s hoping that more of us see how so many new “threats” end up doing more good than harm. Ted Balaker is the Jacobs Fellow at Reason Foundation. One of Balaker’s previous op-eds on Wal-Mart is here and an archive of his work is here. Reason Foundation’s privatization research and commentary is here. But who's the real loser?